Type 4 phosphodiesterase (PDE4) inhibitors have been shown to stimulate bone formation in vivo and to stimulate osteoblastic differentiation in vitro. As one possible mechanism for the stimulation of bone formation is the recruitment of osteoprogenitor cells from the bone marrow, we have investigated the effect of the PDE4 inhibitors EMD273316, EMD95833, EMD249615 and EMD 219906 on fibroblastic colony formation by whole bone marrow cells and on the ability of these colonies to adopt an osteoblastic phenotype. All four agents stimulated colony formation in a concentration dependent manner, however, in the case of EMD273316 & EMD95833, the effect was evident at lower concentrations and the addition of prostaglandin E2 (PGE2) was not necessary for maximal stimulation. It was subsequently found that co-incubation with indomethacin reduced the stimulatory effects of EMD273316 & EMD95833 but had no effect on the actions of EMD249615 and EMD 219906 and that EMD273316 & EMD95833 stimulated the synthesis of endogenous PGE2 by whole bone marrow cells whereas EMD249615 and EMD 219906 had no significant effect. These data suggest that EMD249615, EMD 219906, EMD273316 & EMD95833 can promote the recruitment of bone marrow osteoprogenitor cells leading to a stimulation of bone formation via their direct inhibitory effects on PDE4. The actions of EMD273316 & EMD95833 however, are augmented by their ability to stimulate endogenous prostanoids synthesis which acts synergistically with their direct effects on PDE4. Most bone anabolic agents such as prostaglandin E2 (PGE2), 1,25 dihydroxyvitamin D3 (1,25(OH)2D3) and parathyroid hormone (PTH) have receptors that are distributed widely throughout the body and in multiple tissue types. Because of this broad receptor distribution, these agents give rise to a number of adverse effects, which prevent their widespread use, and it is likely that the development of specific bone agonists will prove extremely difficult. An alternative strategy would be to develop compounds which tissue-selectively potentiate the actions of endogenous agents at the cellular level. Such compounds may act either directly on the agents themselves or on the downstream products of their respective signaling pathways. For example, PTH and PGE2 both act via a receptor mediated mechanism that raises intracellular levels of cyclic AMP, thereby stimulating a range of cyclic nucleotide-dependent kinases. Under normal physiological conditions, cyclic AMP is rapidly degraded by a family of enzymes known as cyclic nucleotide phosphodiesterases (PDE). By preventing this degradation, PDE inhibitors may provide a useful strategy for potentiating the actions of endogenous PTH and PGE2 by both amplifying and prolonging the cyclic AMP response to these agents. Consistent with this possibility, PDEs, which can be classified into at least 11 genetically distinct families (PDE1-11), show differential tissue distribution and PDE inhibitors have been generated which possess tissue selectivity [1, 2]. Subsequently, specific PDE inhibitors have been successfully developed as tissue-selective treatments in other therapeutic areas, such as sildenafil in erectile dysfunction. PDE4 inhibitors appear to stimulate bone formation in vitro and in vivo and have been suggested as possible antiosteoporotic drugs . For example, several PDE4 inhibitors have been shown to stimulate the recruitment of osteoprogenitors from bone marrow in vitro including rolipram, EMD 95833, XT-44 and denbufylline [4–7]. This activity has subsequently been confirmed in a number of animal models including sarcoma-bearing rats [6, 7] denervated rats  and normal mice . Although PDE inhibitors were originally thought to stimulate bone formation by potentiation of PGE2 and PTH, other regulatory factors also appear to be involved, in light of the recent finding that pentoxifylline and rolipram both potentiate the induction of osteogenesis by BMP-2 [9, 10]. In this study we have investigated the ability of a series of PDE4 inhibitors to stimulate the recruitment of osteoprogenitors present in bone marrow as determined by the fibroblastic colony forming unit assay. We find that in addition to their PDE4-inhibitory activity, 2 of the compounds could also stimulate PGE2 synthesis which synergized with the original activity. Initial experiments using the non-selective PDE inhibitor, isobutylmethylxanthine (IBMX) and the PDE4 inhibitor rolipram, showed that treatment with these agents alone could give rise to a significant stimulation in colony number. However, it was also found that co-treatment with concentrations of PGE2 as low as 0.1 nM, which do not normally have any effect in this system, produced almost maximal responses which were of similar magnitude to treatment with 100 nM PGE2 alone (fig. 1a &1b). Synergistic interaction between (a). IBMX or (b). rolipram and PGE2 on fibroblastic colony formation by whole bone marrow. Whole bone marrow was prepared and cultured in the CFU-f assay as described in the text in the presence of either (a). 10 μM IBMX or (b). 10 μM rolipram in combination with varying concentrations of PGE2. The medium was changed for fresh, PDE inhibitor & PGE2-free, medium after 5 d and thereafter twice weekly. The cultures were then stopped after 18 d, fixed with cold ethanol and stained for total colonies with methylene blue. They were then photographed and quantitated. Data presented are mean colony numbers per Petri dish ± S.D. * Denotes significant difference from control cultures, p < 0.05; # denotes significant difference from corresponding IBMX or rolipram-free cultures, p < 0.05. A number of recently developed PDE4 inhibitors (Merck KGaA, Darmstadt, Germany) having broadly similar activities with respect to PDE4 inhibition whilst being considerably less active in terms of PDE3 inhibition (table 1) were screened for their ability to stimulate colony formation in the CFU-f assay. It was found that these varied greatly in their potency with EMD273316 and EMD95833 both producing significant responses at 1 nM and having a maximal effect at 1 μM. 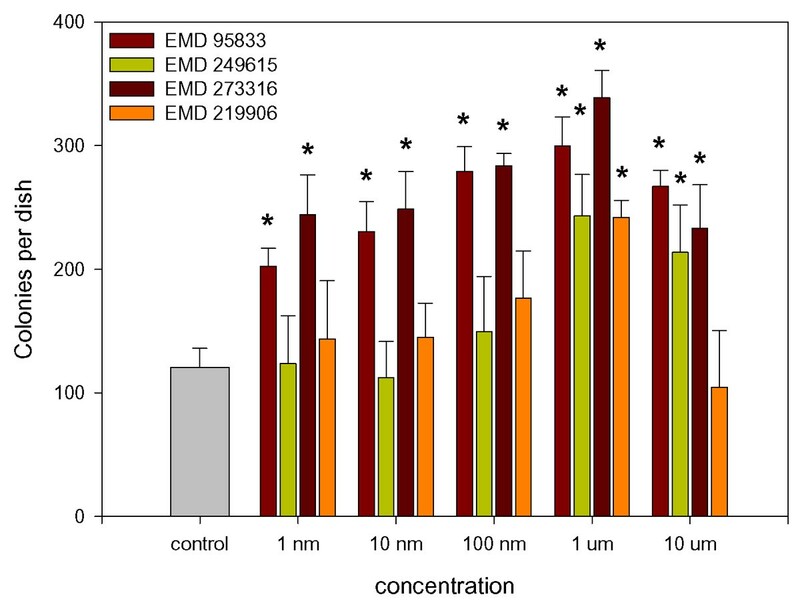 In contrast, neither EMD249615 nor EMD219906 produced a significant response at concentrations lower than 1 μM (Fig. 2). It was also found that, parallel to the increase in total colony number, there was a general increase in the number of colonies displaying characteristics typical of an osteoblastic phenotype, i.e. alkaline phosphatase expression and calcium deposition (fig. 3). The proportion of alkaline phosphatase and calcium positive colonies remains fairly constant throughout with no significant difference being found between controls and cultures treated with PDE-inhibitors. Effect of the PDE inhibitors on the activity of PDE3 and PDE4. Data are presented as means ± S.E.M except in the case PDE3 where a satisfactory IC50 for 3 of the compounds could not be calculated. Effect of PDE4 inhibitors on fibroblastic colony formation by whole bone marrow. Whole bone marrow was prepared and cultured in the CFU-f assay as described in the text and treated with varying concentrations of the PDE4 inhibitors EMD 273316, EMD95833, EMD249615 or EMD219906. Medium changes, fixation and staining were as in Fig. 1. 10-7 M PGE2 was used as a positive control in these experiments. Data presented are mean colony numbers per Petri dish ± S.D. * Denotes significant difference from control cultures, p < 0.05. Effect of the PDE4 inhibitor EMD95833 on fibroblastic colony formation and osteoblastic differentiation. Whole bone marrow was prepared and cultured in the CFU-f assay as described in the text and treated with varying concentrations of EMD95833. 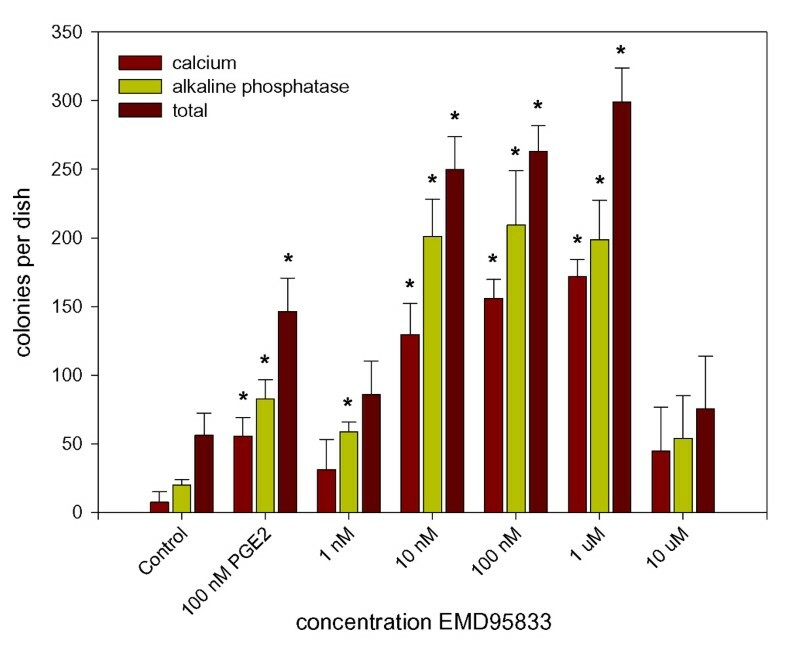 In order to assess the effects of EMD95833 on osteoblastic differentiation, after fixation the cells were stained for alkaline phosphatase with naphtholphosphate/fast red, calcium deposition with alizarin red and total colonies with methylene blue. Data presented are mean colony numbers per Petri dish ± S.D. * Denotes significant difference from the appropriately stained control cultures, p < 0.05. Furthermore, it was found that in contrast to IBMX and rolipram, the addition of exogenous PGE2 had no consistent additional effect on the actions of EMD273316 and EMD95833 (fig. 4). This would suggest that at least a part of the action of these agents is mediate via the induction of endogenous prostanoid synthesis. To test this hypothesis, cells were exposed to the PDE4 inhibitors EMD95833, EMD273316, EMD219906 or EMD249615 at a concentration of 1 μM (the optimal concentration for all 4 agents) in the presence or absence of the cyclooxygenase inhibitor indomethacin (3 μM). This resulted in a significant decrease in the response to the 2 most active PDE inhibitors, EMD95833 and EMD273316. Co-treatment with 3 μM indomethacin also resulted in a decrease in the effects of the less active agents, EMD219906 and EMD249615, however, this did not achieve statistical significance (fig. 5a). Analysis of the cell culture medium from the experiment described in fig. 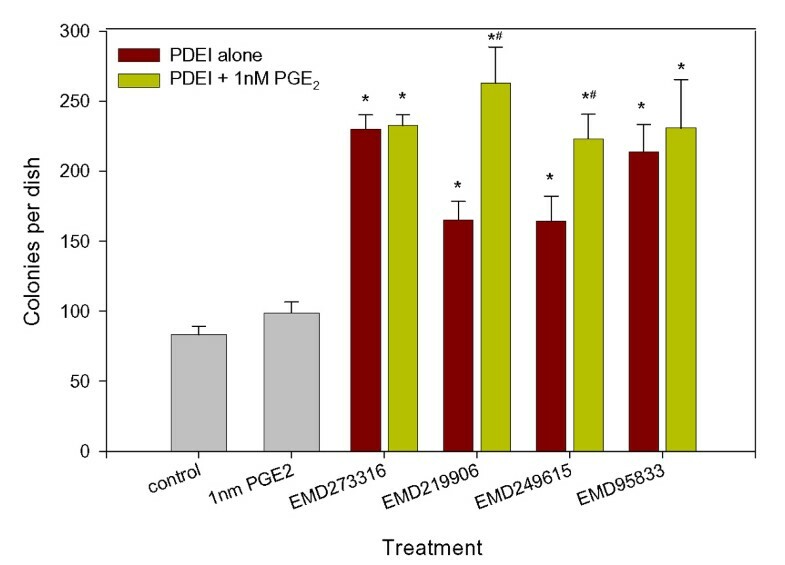 5a revealed that both EMD95833 and EMD273316 caused a significant increase in PGE2 synthesis which was abrogated by co-treatment with 3 μM indomethacin. In contrast neither EMD219906 nor EMD249615 had any significant effect on prostaglandin levels (fig. 5b). Interaction between PDE4 inhibitors and PGE2. CFU-f cultures were carried out as described in Fig. 1 and the cells treated with 1 μM EMD273316, EMD95833, EMD249615 or EMD219906 in the presence or absence of 1 nM PGE2. Data presented are mean colony numbers per Petri dish ± S.D. * Denotes significant difference from control cultures, p < 0.05; # denotes significant difference from corresponding PGE2-free cultures, p < 0.05. The role of endogenous prostanoid synthesis in PDE4 inhibitor-mediated stimulation of colony formation. To test the hypothesis that some of the PDE4 inhibitors were also acting via the stimulation of endogenous prostanoids synthesis, CFU-f cultures were challenged with either EMD95833, EMD273316, EMD219906 or EMD249615 (1 μM) in the presence or absence of 3 μM indomethacin (a.). Medium changes, fixation and staining were as in Fig. 1. In addition, immediately before the first medium change, 1 ml aliquots of medium from were removed and PGE2 levels determined by ELISA (b.). Data presented are means ± S.D. * Denotes significant difference from control cultures, p < 0.05, # denotes significant difference from corresponding indomethacin-free cultures, p < 0.05. In this investigation we have shown that a number of PDE4 inhibitors, including rolipram, IBMX, EMD219906, EMD249615, EMD273316 & EMD95833, stimulate colony formation by rat bone marrow cells in the CFU-f assay. In addition the proportion of colonies expressing alkaline phosphatase and depositing a calcified matrix, both markers associated with osteogenesis, increased proportionately. In the past we have suggested that positive activity in the CFU-f assay may have some value as a predictor of bone anabolic activity in vivo. This is because a number of agents known to stimulate bone formation in vivo such as PGE2 [11, 12] or FGF-2 [13, 14] have also been found to be potent stimulators of colony formation in the CFU-f assay [15–17]. These data therefore, suggest that the increased bone formation seen in animals treated with various PDE4 inhibitors [6–8] may be mediated by the induction of recruitment and differentiation of bone marrow stromal cells. These data are broadly in agreement with other reports on the effects of PDE4 inhibitors on osteoprogenitor cells. XT-44, Ro 20-1724 and denbufylline have all been shown to increase mineralised nodule formation in primary cultures of rat bone marrow cells [6, 7] and pentoxifylline and rolipram stimulated the expression of alkaline phosphatase in the bone marrow stromal cell line, ST2 [4, 18]. The experiments described in these investigations all used monolayer cultures of either cell lines or primary bone marrow cells. Although differentiation undoubtedly does take place, as shown by the results using cell lines, under these conditions it is not possible to say whether the increase in the numbers of mineralised nodules could be due to increases in the numbers of cells differentiating or due to the proliferation or recruitment of osteoprogenitor cells. In this study however, we have used CFU-f cultures which measure the numbers of proliferating stromal cells present in whole bone marrow. The increase in colony numbers seen after treatment with the PDE inhibitors, suggests that stromal cells, that would otherwise have remained quiescent, have been activated and induced to proliferate. As the proportion of colonies expressing alkaline phosphatase remained fairly constant throughout, it seems likely that the increase differentiation is due to an increase in the recruitment of precursor cells rather than a direct effect on differentiation. The principle action of these drugs is to inhibit the enzyme Type 4 phosphodiesterase and thereby increase intracellular levels of cyclic AMP. It might therefore, be expected that they would only be active in the presence of agents such as PTH or PGE2, that act by stimulating the synthesis of cyclic AMP. Indeed a number of the agents tested, including IBMX, rolipram, EMD219906 and EMD249615 produced only modest effects when used in isolation. However, when used in combination with PGE2, synergistic effects were seen such that almost maximal stimulation of colony number was achieved at concentrations of PGE2 that do not normally have a significant effect in this system. The mechanism underlying the stimulation seen in response to these agents in the absence of exogenous prostanoids is open to speculation. It is possible that non-prostanoid agents present in the cultures are responsible for a basal level of cyclic AMP synthesis or alternatively, low levels of prostanoids, below the detection limit of the ELISA used, may be responsible. In contrast EMD95833 and EMD273316 gave rise to significant increases in colony number in the absence of PGE2 and the addition of PGE2 had no further effect. This suggests that these agents stimulate the production of endogenous stimulators of cyclic AMP synthesis such as prostanoids. To support this hypothesis, inhibition of prostanoid synthesis by the addition of indomethacin to the cultures abrogated the stimulatory effects of the PDE inhibitors. Furthermore, direct measurement of PGE2 in the culture medium revealed that both EMD273316 and EMD95833 stimulated the production of PGE2 by whole bone marrow cells whereas EMD219906 and EMD249615 had no such effect. This is consistent with the effects of PDE4 inhibitors in other systems. PGE2 production has been shown to be stimulated by a number of specific PDE4 inhibitors in various cell types including bovine airway smooth muscle cells by Ro-20-1724 , whole blood by RP73401  and human peripheral blood mononuclear cells by rolipram and CDP840 . It is known that prostaglandins are derived from arachidonic acid via the actions of two enzymes termed cyclooxygenase-1 (COX-1) and cylooxygenase-2 (COX-2). Broadly speaking COX-1 is thought to be present at relatively constant levels and is responsible for the housekeeping functions of prostanoids. In contrast, COX-2 expression is induced by a wide variety of cytokines, growth factors and other stimuli and is involved in the acute response to a number of pathological situations, in particular inflammation . The fact that PGE2 synthesis was increased after the addition of EMD273316 and EMD95833 would suggest the involvement of COX-2 however, this will need to be confirmed using specific inhibitors. Recently, Miyamoto et al  demonstrated that the PDE4 inhibitor XT-611 also gave rise to bone-anabolic effects in an in vitro bone marrow culture system. The system used was slightly different to that described above in that determined calcified nodule formation in confluent cultures of bone marrow cells. However, they did show that XT-611 stimulated PGE2 accumulation which potentiated the PDE4-related actions of XT-611. Furthermore they showed that this effect could be blocked by the addition of the COX-2 antagonists zaltoprofen and NS-398 . In summary, these data suggest that the bone anabolic effects of PDE4 inhibitors may be mediated by the recruitment and proliferation of quiescent bone marrow stromal cells followed by their osteoblastic differentiation. In the case of EMD219906 and EMD249615 this effect appears to be due to their direct effects on PDE4. EMD273316 and EMD95833 however, also stimulate the synthesis of endogenous PGE2 synthesis which then synergises with the PDE inhibitors enabling them to achieve maximal stimulation in the absence of exogenous stimulators of cyclic AMP synthesis. EMD95833, EMD273316, EMD219906 and EMD249615 were supplied by Merck KGaA, Darmstadt, Germany and used as supplied. Stock solutions were prepared in DMSO and then diluted in cell culture medium such that the final concentration of DMSO in the medium was less than 0.1% v/v. Cell culture medium, Glutamax, and Penicillin-Streptomycin and all other chemicals and reagents were from Sigma Chemical Company Ltd. (Poole, Dorset, U.K.). Serum supreme (modified newborn calf serum, SS) was from Biowhittaker (Wokingham, UK). Tissue culture plastics were obtained from Scientific Laboratory Supplies (Nottingham, UK). Male Wistar rats (~200 g) were obtained from Harlan (Bicester, UK) and kept according to Home Office guidelines at the Sheffield University Medical School animal facility. In order to analyse CFU-f numbers, 2 × 106 BMC were plated out in 55 cm2 petri dishes in DMEM containing 10% SS, 10-8 M dexamethasone and 50 μg/ml ascorbic acid, together with vehicle, PDE inhibitor or PGE2 (10-7 M). The medium was changed after 5 days for DMEM containing 10% FCS, 10-8 M dexamethasone and 50 μg/ml ascorbic acid, and thereafter twice weekly. The cultures were exposed to the agents for the first 5 days of the culture period as previous experiments had shown that this level of exposure achieved a maximal effect on colony number. The cultures were maintained for 18 days after which time the cells were washed with PBS and fixed by the addition of cold ethanol. After fixation, the cultures were stained sequentially for alkaline phosphatase (APase), calcium and collagen positive colonies, and total colonies as described below. After each staining procedure, the culture dishes were photographed using a digital camera and then destained. The images were analysed using Bioimage "Intelligent Quantifier" and the number of colonies was calculated. After fixation with ethanol, the cultures were was stained histochemically for APase as described by Bancroft and Stevens . The cells were exposed for 30 min at 20°C to a solution of naphtholphosphate (0.05 mg/ml) in Tris buffer (0.08 M, pH 7.5) containing fast red bb (1 mg/ml). The cultures were then washed under running tap water, photographed and then destained with absolute ethanol. Calcified colonies were identified by staining with alizarin red pH 6.2 for 30 min followed by washing under running tap water to remove unbound dye. The cultures were then photographed and destained with 5% perchloric acid. To assess total colony numbers, the cultures were stained with 0.1% methylene blue in borate buffer (10 mM, pH 8.8) for 30 min, and then thoroughly washed under running tap water. The cultures were then photographed, and the methylene blue positive CFU-f used as a measure of total colony numbers. Colony numbers were assessed using the method of Dobson et al . Briefly, the acquired digital images were imported into Photoshop, colony irregularities smoothed out and converted into a 256 level greyscale format. The greyscale images were then imported into Bioimage "Intelligent Quantifier" and the colony number calculated. Before the first medium change on day 5, 1 ml aliquots of medium were removed and PGE2 levels were determined using a commercially available ELISA kit (Amersham) according to the manufacturer's instructions. Data are presented as group mean ± standard deviation. At least 3 replicates of each experiment were performed, and the results presented in the figures and tables of the report are representative of these. For each variable, effects across treatment groups were compared with one-way analysis of variance (ANOVA). If the overall difference was significant, multiple comparisons were performed between groups with Tukey's test. Differences are considered significant at a probability <0.05 on a two-tailed test. We would like to thank Dr. Rochus Jonas, Medicinal Chemistry, Merck KGaA, for providing the PDE inhibitors used in this study. AS carried out all cell biological work in this manuscript. CF was involved in the development of the compounds. NB carried out the phosphodiesterase inhibition assays. All authors were involved in the preparation of the manuscript.